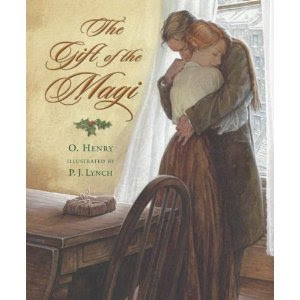 I don't even remember the last time I read The Gift of the Magi , by O. Henry. Let's just say it had been awhile. However, I do remember it being a very compelling read and so when I came across a copy at our local used bookstore, I snatched it up. I did remember correctly - it is a compelling story. "In a shabby New York flat, Della sobs as she counts the few coins she has saved to buy a Christmas present for her husband, Jim. A gift worthy of her devotion will require a great sacrifice: selling her long, beautiful hair. Jim, meanwhile, has made a sacrifice for Della that is no less difficult. As they exchange gifts on Christmas Eve, the discovery of what each has done fills them with despair, until they realize that the true gifts of Christmas can be found more readily in their humble apartment than in any fine store." This book is definitely not an easy read aloud for children. Some of the vocabulary words were above my head, although I'm kinda hesitant to admit that! Regardless of some challenging words here and there, the meaning of the story shines through: sacrificial love is the greatest and most treasured, valuable love of all. You can read this story in a number of locations online if you'd like. This particular version I picked up contains the illustrations of P.J. Lynch who brings Della and Jim to life in an absolutely delightful and magical way. I think Lynch does a remarkable job showing off both their material poverty and yet capturing expressions that truly reflect the love and admiration that these two characters have for one another. This story opens with Della wanting to honor her husband who she feels is deserving of honor and respect - not only from herself but from others. She desperately wants to gift him with something that she believes will show his true value in the eyes of the world. In other words, she greatly esteems him. Jim sells the material item most precious and valuable to him in order to love his wife. He takes pride in who she is and he sacrifices himself, essentially, to make her beautiful and to show how much he loves and cherishes her. To me this book isn't just about the giving and receiving of gifts, but it properly displays the love a husband and a wife should have for one another. The world doesn't exactly encourage us as individuals to place another ahead of us. We're encouraged to think independently of our life partners and do what's best for us -- make sure we get that "me" time. Jim and Della seem oblivious to this modern message. Instead they are wholly wrapped up in one another - in each other's joys and sorrows. They do not have much but what they do have is a working marital relationship. I think perhaps that is one thing that many in today's society should be righteously jealous for. I get that this particular edition of The Gift of the Magi is presented as a children's story but I almost think it's more of an appropriate parable for married couples to read and think about. I'm a selfish person. That's my human nature. To love sacrificially does not come naturally. But it's what I vowed and promised Jonathan I would learn how to do. This book has me re-evaluating my own attitude within my marriage so it's a good and healthy read for me this Christmas season. I recommend this read, obviously. Not just to teach children that it is 'more blessed to give than to receive' but to remind our adult selves of the same. This is on my list to read this week with JAM! I don't have a paper copy, so we were going to read it online. It's one of my favorites! I never considered it a children's story. At all. But yes, it demonstrates something we ALL need less of...selfish desires. I love this story. The first time I read it, I cried. So touching! I read this for the first time this last year in a compilation from my library--and thought it was probably one of the best "Christmas" stories I've ever read. Even so, like you said, it's so much more than a Christmas story. Thanks for reminding me of this wonderful story. Oh, thanks so much for sharing! I had never read it, and it brought tears to my eyes!! which has some of the vocab words highlighted and if you click on them it brings up a box with the definition. I last read it in 8th grade-I think I'm definitely due for a re-read! thanks for sharing! I love P. J. Lynch's illustrations and this story. I'll have to put this on my list of books to get. I keep forgetting to add this story to our Christmas book collection. Thanks for the reminder!